Mitzi Fox of Albion was awarded the Charles L. Whitney Award for Outstanding Service recently at the annual meeting of Prairie Plains Resource Institute in Aurora. 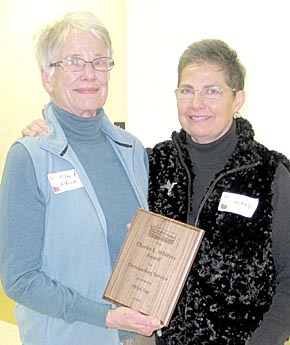 Fox, long-time member, board member and advocate of Prairie Plains, was recognized for her service and dedication to the Olson Nature Preserve north of Albion. Approached by a group of local citizens interested in preserving a piece of the Grant and Berenice Olson ranch for public use, Prairie Plains Resource Institute took ownership of the Olson Nature Preserve in 1995. Since that time the Preserve has become a hub of activity for area schools, scouts and countless other groups.